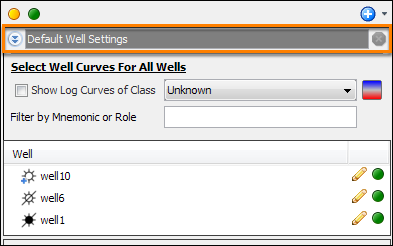 Default well curves can be configured in the Default Well Settings section of the Well tab. The well curves are then applied to ALL the wells in the session. To configure the default well settings for ALL wells, click on the arrow icon at the top left of the Well tab to expand the Default Well Settings. Select the Show Log Curves of Class check box to restrict ALL wells to only show log curves of a particular class, and select the class and colourbar in the drop-down list. Note: As this option will affect all wells, it is only available in the Default Well Settings section. If a group with a well curve class is selected for viewing, Insight will use the log curve class from the group.